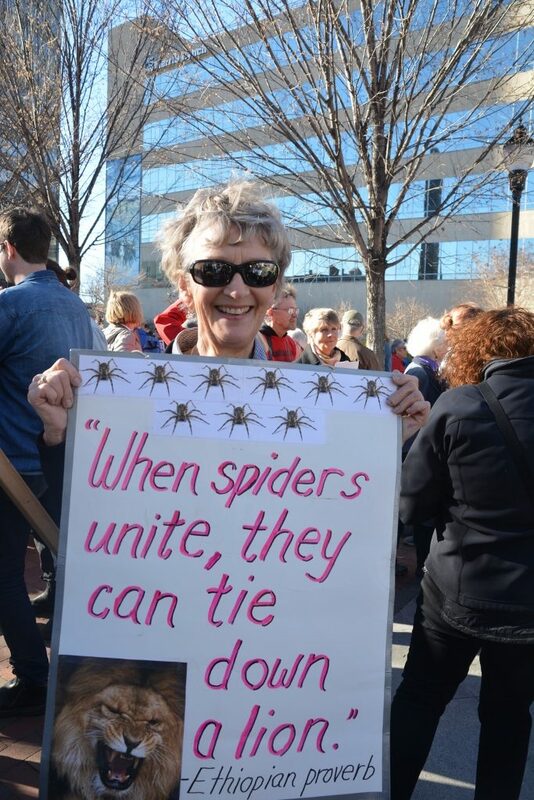 Kitty Schaller holds my favorite sign from Saturday’s rally. I was ready to make a very public exit from the Democratic party if Tom Perez won the chairmanship, but other events Saturday raised my hopes for the party. It started with the precinct cluster meetings in the morning. I’m vice-chair of my precinct (45.1 in Buncombe County, NC), and in previous years, the chair, John Parker, and I had to scramble to get five people out to a meeting so we could have a quorum. We had to make calls and get people to the meetings so our precinct wouldn’t lose our “organized” status. “Can you just stop by for a half hour while we vote on resolutions and elect officers?” we begged. We were able to keep organized, but barely. Yesterday, instead of begging for people to show up, we had 16 people, several of whom were young and progressive. The others were from a retirement community, and I was afraid they might be conservative Democrats like the ones who killed several progressive resolutions last year, but they were old-style progressives who decided to become active again so we could take our party back from pro-corporate influences. Last year a conservative banker convinced people to vote against a resolution calling for re-regulation of the banks and against a resolution calling for a Constitutional amendment to overturn Citizens United. He wouldn’t stop talking until he had the votes to defeat these two resolutions. This year, the banker was nowhere to be seen and both resolutions passed unanimously, along with resolutions calling for an immediate raise in the minimum wage to $15, plus one calling for a single-payer health care system. In all, we passed nearly a dozen progressive resolutions, all unanimously. I wrote two resolutions — the ones calling for the $15 minimum wage and Medicare for all — and most of the precincts passed them without amendments. One precinct leader asked if the minimum wage resolution could be amended to phase in the $15 over three to five years. I told them no. If you’re making $7.25 an hour, five years without a living wage is not an option. The raise is needed now, and in five years, inflation adjustments should have it up to about $20. People need to be able to feed, clothe and shelter their families NOW, not in five years. “Well, these a pretty conservative people,” the precinct chair said. These new party activists were Bernie Sanders supporters, determined to move the Democratic Party back to its FDR progressivism, back to the days when LBJ signed the Civil Rights and Voting Rights acts. They were inspired by the organization, Our Revolution, which is comprised of progressive fighters. I left the precinct meeting with renewed faith that we can do this. From there, I went to speak at an Our Revolution rally downtown. We had 500 people turn out to call for improvements to our health care system, from support of keeping and improving the ACA, to a public option in the marketplace, to single-payer. I told my son’s story and reminded people that 45,000 Americans died the same way every year before the ACA took effect. We’re still losing 15,000 to 20,000 in states that haven’t expanded Medicaid. What I saw yesterday was a determination to take the Democratic Party left again. When it was announced that Tom Perez won the party chair election, we were encouraged by the fact that the election was close and that our candidate, Keith Ellison, is now the vice-chair and that Perez has vowed to work closely with him. I am encouraged. We have to remember that the Republican right wing has worked since the 1960s to achieve what it has, and that in one election cycle, we progressives have made remarkable progress. So, let’s follow the Indivisible playbook. Let’s take this nation back in the 2018 elections, despite gerrymandering, despite voter suppression laws. We are the majority. If we work for this, and most importantly, if we vote, we will not fail.